The months-long witch hunt that gripped late-17th century Massachusetts continues to pique our morbid curiosity today. 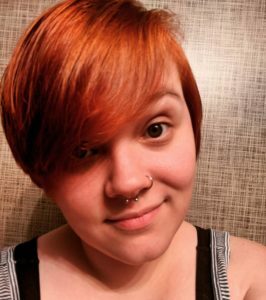 How did a small group of teenagers manage to stir up an unprecedented level of fear? And, perhaps more importantly, why did they? Obviously, with only four titles, this list is in no way exhaustive. 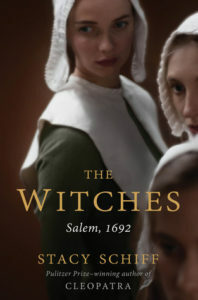 These books about the Salem Witch Trials are intended to be a jumping off point for readers who want to learn more about this intense period of U.S. history. In any case, I hope that the books I’ve selected will answer at least some of your questions about what happened in Salem. Stacy Schiff’s 2006 biography of Cleopatra won the Pulitzer. In The Witches: Salem, 1692, she focuses her fabulous talent for writing history on another gynocentric story. At 417 pages, Schiff’s microhistory may present a daunting face to anyone who isn’t used to tackling thick volumes. Additionally, some reviewers on Goodreads have taken issue with Schiff’s tendency to describe the more fantastical elements of the Salem story — such as women flying on broomsticks — as if they might actually have happened. That being said, anyone looking for a book about the Salem Witch Trials that takes the Massachusetts colony’s place in the world into account will find little better than The Witches: Salem, 1692. Out of the 20 accused witches executed in Salem, 14 were women and girls. 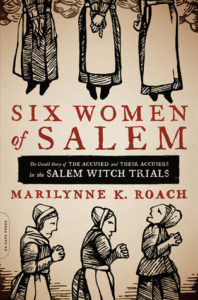 In Six Women of Salem, author Marilynne K. Roach focuses on the trials’ most famous accused and accusers: Tituba, Rebecca Nurse, Ann Putnam, Mary Warren, Bridget Bishop, and Mary English. Some readers will balk at Roach’s inclusion of deep biography and other historical facts. Those who really want to dig into the close-knit Salem and untangle interpersonal politics will no doubt relish the detail that Six Women of Salem offers. In this novel, Kathleen Kent delves into the lives of her ancestors. Martha Carrier and her children were among the 200-plus individuals accused during the witch trials, and she would ultimately be hanged on testimonies tortured out of young Sarah Carrier and her three older siblings. 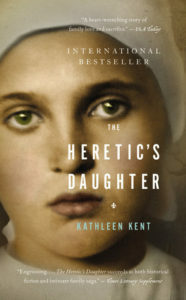 In The Heretic’s Daughter, Kent explores the family bonds and maternal strength that shaped Sarah’s experience, from her mother’s initial arrest, through the siblings’ imprisonment, and finally to their release and the aftermath of the Salem Witch Trials. Guadeloupean author Maryse Condé offers her own retelling of the life of Tituba: a slave in the home of the Reverend Samuel Parris. In real life, she was the first to be accused by Elizabeth Parris and Abigail Williams, and was beaten by Reverend Parris until she confessed to witchcraft. Surprisingly, Tituba was not among the 14 women executed, and was instead freed from prison and taken away from Salem by an unknown person. If there were ever any, no accounts survive of her life after the Salem Witch Trials. 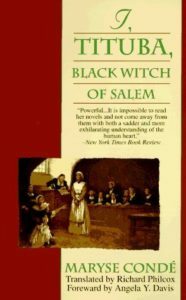 In I, Tituba, Black Witch of Salem, Condé fills in the gaps in Tituba’s story to create an engrossing work of historical fiction that shouldn’t be overlooked.